Granada, 니카라구아의 셀리나 그라나다 | 호스텔월드에서 예약하세요. Granada is a city in western Nicaragua and the capital of the Granada Department. It is Nicaragua's sixth most populous city and one of the historical treasures of the country. It has a rich colonial heritage, seen in its architecture structure and the streets with bright colours; Nobody would miss its free museums of coffee, chocolate, history and art. Granada had a thriving Indigenous population, until it was attacked in the early 16th Century by Spain. Selina Granada is at a hand of the Masaya and Mombacho Volcanoes and the Apoyo lagoon. 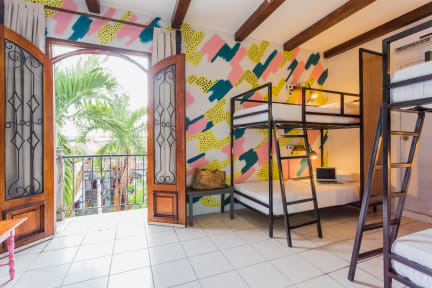 Enjoy our Coworking spaces, activity center with daily wellness programs and tours to the best attractions of the surroundings of this special and warm city of Central America. 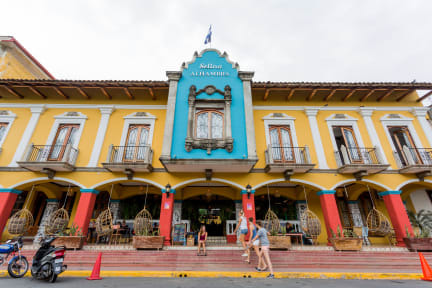 Granada is located 50 km south from Managua, the most common way to get here is taking a bus or a taxi from Managua’s airport. The taxes are composed of 15% VAT and 2% City Tax. The reception service is open from 07.00 to 23.00. Bring a lock for your locker, or you can purchase one from us. We will keep your bags for free all day long if you need.